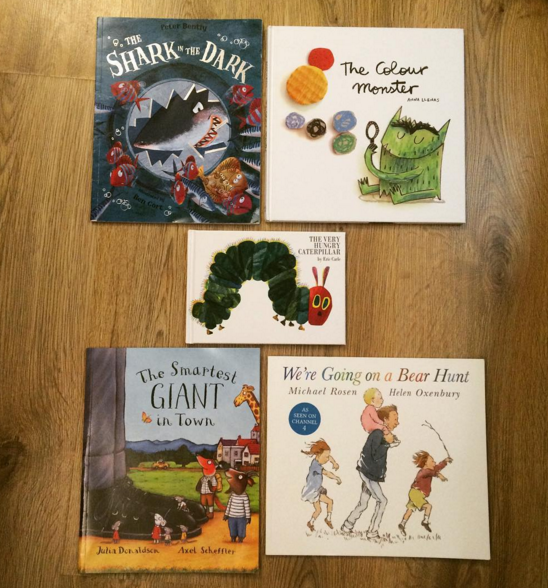 Lily's Little Learners: Monthly Book Roundup - What we have been reading in January. Monthly Book Roundup - What we have been reading in January. Its time for my monthly book round up again. Each month I write about new books that I have introduced to Lily at bedtime and what we think of them. We always read around 4-5 books a night and most nights we end up reading the same ones with a few odd ones read in between. I find reading the same books helps Lily relax and she does grow fond of the stories each month and gets excited when I get them out to read each night. This month we haven't really had a theme but have read some classics. I had to include The Very Hungry Caterpillar seen as we saw the Live show earlier this month. Here are this months reads. Not a bad book, but not our favourite from this month. It has a really great rhyme to it but I felt like the storyline was a little boring. The Shark is really hungry, and is wanting to eat all the fish in the sea and everyone is scared of him. Eventually the fish rebel and scare the shark instead making him go back to the dark. If you have a child that is a big fan of sharks then they are sure to like this book. The book is a Macmillan published book and Im not sure where I picked this one up from but Im sure you can find it online if you searched. This was Lily's and My favourite this month. I find the book really different to other books and the story is teaching children all about feelings in such a nice way. In the start of the book you meet the colour monster, his colours are all mixed up because so are his feelings. A little girl decides to help him and they look at all the different feelings and colours. Each colour has a different meaning, for example Blue is sadness. I think its a really nice book to start to teach children about how they may be feeling and also encourage children to maybe talk about their feelings. It was also a really nice calm story to read at night. Lily really liked the part where it talks about calm, we both take a nice deep breath during the story and this I like to think helps her relax. I have now used the big breath when I am needing Lily to be calm and she understands that. So the book has definetly helped with her feelings. I won this book from Templar Publishing but you can pick this book up online. This is an obvious classic that most people know about and have all probably read. Incase you haven't, the story features a caterpillar that each day eats more and more until he is really fat, he then sleeps, and wakes up a beautiful butterfly. Its a simple but beautiful story that shows how a caterpillar turns into a butterfly. Lily after seeing it live really enjoyed listening to the story. She loved naming the fruit and got really excited to see the butterfly at the end. You can pick up The Very Hungry Caterpillar from most book stores. This is a Juilia Donaldson story that isn't as well known as some of her classics like the Gruffalo and Room on the Broom. But non the less its not one to be missed. The story is about a giant that decides he wants to dress a little more smartly. He buys himself a suit. As he walks around he ends up having to kindly give pieces of his clothing to other animals to help them out. For example a sock becomes a bed for a Fox. He does not feel sad about loosing his clothes and instead sings a rhyme about where his clothes have gone. Eventually he does get a little sad as he lends out his belt and his trousers start to fall down. But the animals who he has helped all make him a little gift to cheer him up again. Its such a great story about kindness and I love the little rhyme. The story is quite long and so sometimes this would be the only one I would read in a night to Lily. A few times it was to long and she started to fall asleep so I had to skip some pages. But she did enjoy the book and asked for it quite a few times. You can buy this book from most book stores or order it online. This is again another classic that you may of heard of or even read. You may have even heard the rhyme that gets sung in nurseries. I decided that with the upcoming release of the DVD it would be a nice one to read to Lily. Each time I start the story Lily starts to grin. The story is quite repetitive which children do enjoy listening to. The repetition is also good for helping children learn to read. The story is about an adventure to find a bear. They have go through long grass, a forest, and other adventurous places. They can't go over them, and they can't go under them so they have to go through them. They eventually get to a cave where they find the bear. This is Lily's favourite part and she would scream out "BEAR" at the top of her lungs. The family run back to their home scared and decide they aren't going on a bear hunt again. Lily actually got sad at the end of the story because the bear leaves. Bless her. You can get this book from most book shops. Also keep your eye out on the blog as I will be writing about the new DVD and a very exciting Bear Hunt Twitter party. The Very Hungery Caterpillar is a book the children have really enjoyed. I don't know anyone with kids young enough for these at the moment, but will save it for future reference - The Colour Monster does look good! The Colour Monster looks great. I hadn't heard of that one! How was the show? Would like the opportunity to attend with the children. As The Very Hungry Vaterpillar is a well loved book. My son wants to read Shark in the Dark - we went to see the stage show of Shark in the Park and have read the book, he absolutely loves it. The Smatest Giant sounds nice.